The winner of London's best loaf has been revealed. and the man behind it has been baking bread for less than a year! The ‘Peckham Rye’ loaf (pictured above), baked by Brick House, an artisan sourdough bakery in East Dulwich, was crowned the best loaf in London at the Real Bread Campaign at Southbank today (October 5), after beating 20 other short-listed loaves from across the capital. The Real Bread Campaign and Jellied Eel magazine ran The Londoners’ Loaf competition, and winning baker Fergus Jackson (pictured here), who used to be in advertising but gave it up for the love of bread, said that he was “shocked and overwhelmed” to have won. 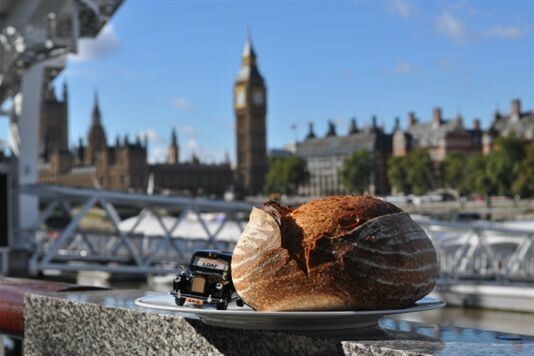 Three foodie judges – The Sunday Times’ Lucas Hollweg, The Daily Telegraph’s Diana Henry and The London Evening Standard’s Victoria Stewart – picked Fergus’ maslin (rye and wheat) sourdough loaf as winner. This is what they said about it, respectively: “Pretty much perfect bread in all sorts of ways”; “It looks so beautiful that you just have to break it open”; and “it delivers on everything its looks promise”. We tasted it too, and were especially impressed with the crisp crust and soft, fluffy centre. The Brick House, which is yet to develop a proper website, only bakes around 400 loaves a week for local shops, cafes, and a weekly stall at Herne Hill market, although Fergus has just signed up his first employee to help.